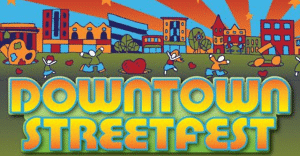 Kickoff the summer events schedule with Downtown Streetfest Saturday, May 20, 2017 along Capitol Street, between Quarrier and Lee Streets. It is brought to by the Charleston Area Alliance and sponsored by City National Bank, along with sponsorship support from the Charleston Convention & Visitors Bureau, the Kanawha County Public Library and Tony the Tailor. Meet up with friends and family between 4:30 and 9 p.m. for live music, food and drinks, kid’s activities, pop-up shops and much more. Grab a bite to eat at your favorite downtown establishments, let the kid’s play and listen to some live music.